The volunteers from Lawrence Berkeley Lab spent their Saturday making improvements in the South Berkeley Senior Center. 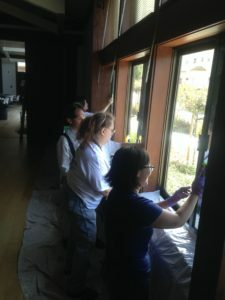 They sanded and painted railings, applied energy efficient film to windows, and generally brought their great energy and sunny dispositions to the Senior Center. Led by House Captain Alice La Pierre, Yingying, Rodney, Jennifer, Bruce, Julie, Katherine, Laura, Marty, Sara, and Tadotoshi all cheerfully accepted every task they were given. While making life better for Berkeley Seniors, they also got to eat good food, have fun and go home with a famous Rebuilding Together Tee-Shirt! Thank you team, for a job well done! Learning a new skill. The fine art of applying energy efficient metalic film to windows can be frustrating. Getting those pesky corners to line up perfectly requires patience and a good sense of humor!